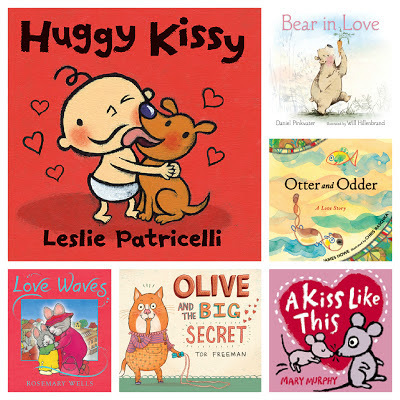 Fall in love this Valentine’s Day with a Candlewick book! If your kids are anything like mine then they LOVE books! They look forward to climbing up on my lap to take in the stories of some of their favorite characters. When the kids get new books to read--WATCH OUT, you have never seen such excitement! When the boys saw Huggy Kissy they instantly knew that it was from the same author as two of their other favorite books; Tubby and Potty! Huggy Kissy sure didn't disappoint either. Leslie has a way with words as she makes her books as fun to read as it is for children to listen. My favorite book was A Kiss Like This by Mary Murphy. It shows different ways that animals kiss their babies and of course, I couldn't resist joining in while reading! Bear in Love is seriously a super cute story of sharing and friendship. It was fun to ask Dexter "who do you think the secret admirer is?" Want to win all 6 of these hardcover books valued at $75?! I thought so! Enter below. *I was given the above books in exchange for a review. I was not obligated to write a positive review and all opinions are 100% my own. At Premium Chocolatiers, I like the Grand Marnier Truffles. At Candlewick's website, I also like the book "One Spotted Giraffe". "I want my hat back" and "This is not my hat" both look wonderful. Our favorite book these days is "Where is Baby's Belly Button?" I love so many books,it would be hard to pick a favorite. For winter it has been Stranger in the Woods. We love the if you give a moose a muffin! My daughter has always loved the Arthur books. My daughter's favorite book is The Pout Pout Fish. The girls are enjoying listening to Uncle Wiggly at night in bed! All Kinds of Kisses by Nancy Tafuri. Oh its a toss up right now betweetn The Very Hungry Caterpillar and Goodnight Moon! Carter just loves being read! My kids frequently switch their favorite books. My son has been reading a lot of joke books lately, and my daughter has been enjoying her Princess Counting 1-10 book. I personally loved "The Country Bunny and The Little Gold Shoes". Not sure who the author is, but I loved it as a kid. Goodnight Moon is my favorite! My sons favorite book is the very hungry caterpillar.